The media are always keen to say ‘a heatwave is on the way’ when it is more likely to just be a short spell of fine weather with temperatures a few degrees above average. Forecasts of 30C and above see editors up and down the land reaching for their stock pics of office workers and kids enjoying ice creams in parks. ‘Hotter than the Costas’ and other hackeneyed headlines are wheeled out as photos of scantily-clad women frolicking in the sea at Brighton illustrate this amazing fact – the more ubiquitous shirtless lorry drivers on the capital’s roads never seem to make the final editions. So how do you quantify a heatwave? Even in an average year the UK normally sees at least one spell of very warm weather that can often feel much warmer than it actually is. Looking at data for the London area stretching back to the early 1800s there has been plenty of hot spells, including the summer of 1808 where birds reportedly ‘dropped out of the sky’ from heat exhaustion. The World Meteorological Organization’s description of a heatwave is “when the daily maximum temperature on more than five consecutive days exceeds the average maximum temperature by 5°C, the normal period being 1961-1990″. Though it has no official definition the UK Met Office, working with the Department of Health, provides a ‘Heat-Health Watch System’ for England which is triggered when a threshold temperature in the South East is 31°C by day and 16°C overnight for at least two consecutive days. A mean daily temperature of 23.5°C or higher has been achieved in this area on 199 days since 1852. To qualify for the Met Office’s Heat-Health Watch System the list, which goes back 163 years, narrows. However, to make my job easier, I have narrowed the list further to 3 consecutive days where the mean has been 23.5°C or higher. Though I loathe really hot weather in my experience I can put up with it for a couple of days. It is only when it gets to the third day of hot, sleepless nights that it starts becoming unbearable. “Not a cloud obscured the burning rays of the sun, and in the middle hours of the day moving about on the moor was not unattended with danger.” The weather was the complete opposite of the previous two years where “rain fell so continuously that only the keenest of the keen ventured abroad”. 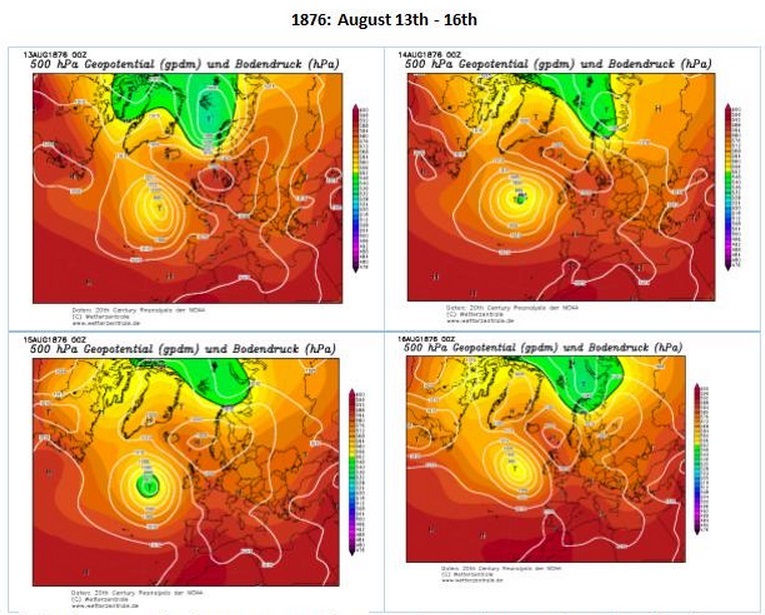 It would be another 26 years before Greenwich would see another heatwave of the same magnitude. Tucked away on page 16 of Lloyd’s Weekly Newspaper on Sunday 20th August 1893 a national round-up column spoke of ‘The Excessive Heat’ of the past week of that heatwave which ranks 11th in the league of heatwaves. Several cases of sunstroke were recorded among soldiers from Plymouth Garrison. A regiment from West Riding were ordered off parade while some regiments took the unprecedented step of parading in shirtsleeves. An engine-driver, when running the express into Stoke station, became seriously ill and died directly after his admission to hospital. His death is attributed to the intense heat. Harvesters in Ashford, Kent, also downed tools after a fatality and several cases of sunstroke. National newspapers of the day took a broader view of proceedings. 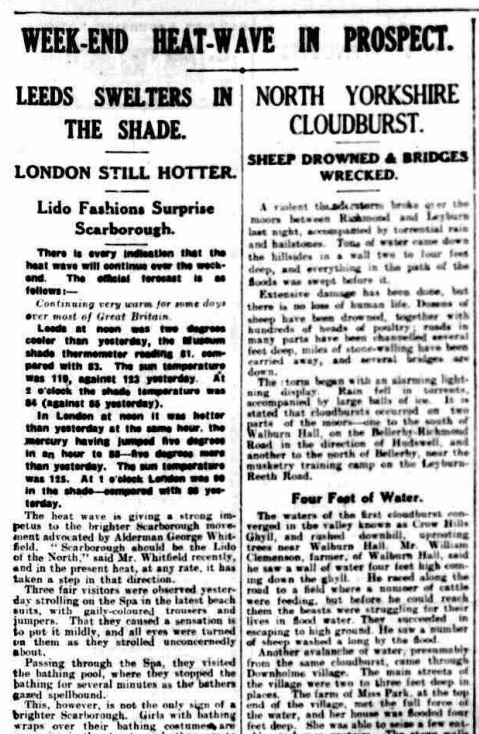 The Daily Telegraph‘s assumption on the cause of the heatwave and prognosis of conditions was actually better than it is today. 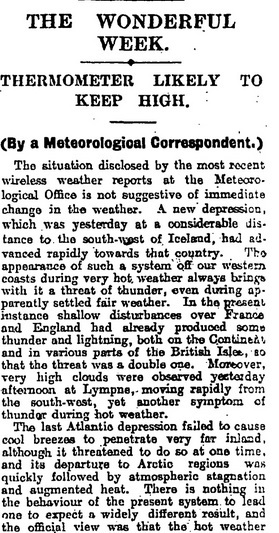 The paper describes a “great thunderstorm that had kept everyone in the south of England awake a week earlier” that was assumed to have been the end of a hot summer. But the heat built again. The paper reports of people falling ill with fever in the heat, possibly caused by water supply. While the Thames, thanks to reforms by the County Council, was not smelling Glaswegians close to the Clyde were not so fortunate, the river being “overpoweringly odorous all the summer”. The glorious summer of 1911, surprisingly, did not produce a spell that would satisfy my heatwave criteria. The season, which produced hot weather throughout July and August, is worthy of mention, however, because August 9th saw the first occasion 100°F was recorded in London. Considering the magnitude of this milestone the media of the day seemed reluctant to go overboard with the coverage, simply reporting the facts. 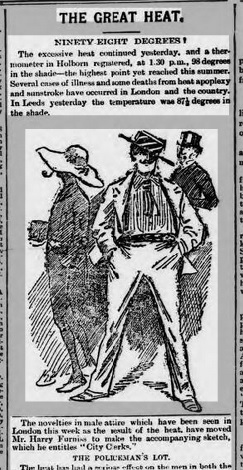 The day after the hottest day ever the Dundee Evening Post had some advice on attire for hot weather, including a reported sighting of Keir Hardie in a “duck suit”. By 1923, a heatwave that placed 14th, reports were going beyond records of temperature and heat-related deaths. On July 16th a reader of the Gloucester Citizen was bemoaning the fact that visitors to London were being subjected to “heatwave profiteering”. The London Letter column in the Hull Daily Mail on Friday 13th July mentions MP’s braving the stifling heat to hear Prime Minister Stanley Baldwin’s statement on European policy, and also “London The Boil”. 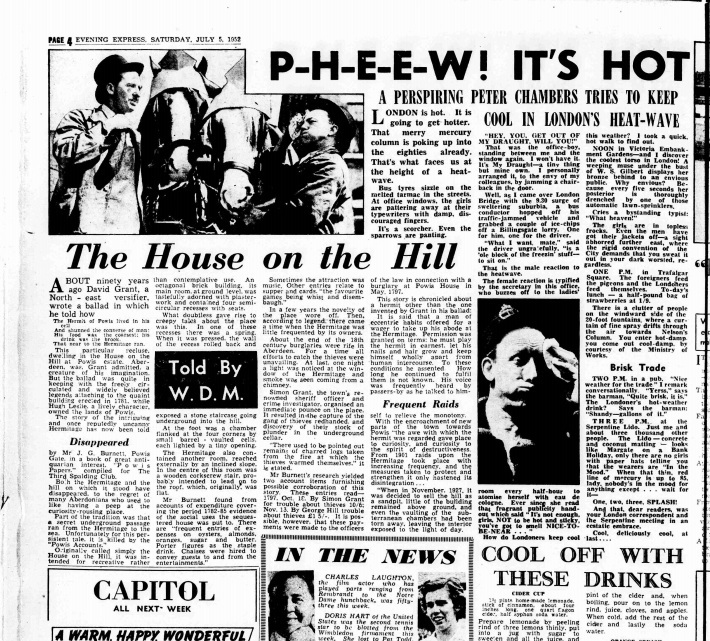 The column, written decades before the advent of air conditioned comfort became the norm, also gives advice on where to keep cool in the capital. Previous favourites had included the cold-storage warehouses along the riverside at Blackfriars Bridge, the Monument and Westminster’s “Byzantine” tower. The heatwave of August 27th – 29th 1930, which ranks 15th, produced another interesting ‘London Letter’ column in the Portsmouth Evening News about too-hot cabs and heatwave profiteering: a greengrocer raising the price of lemons from 1d to 13d, despite there being crates available in storerooms! 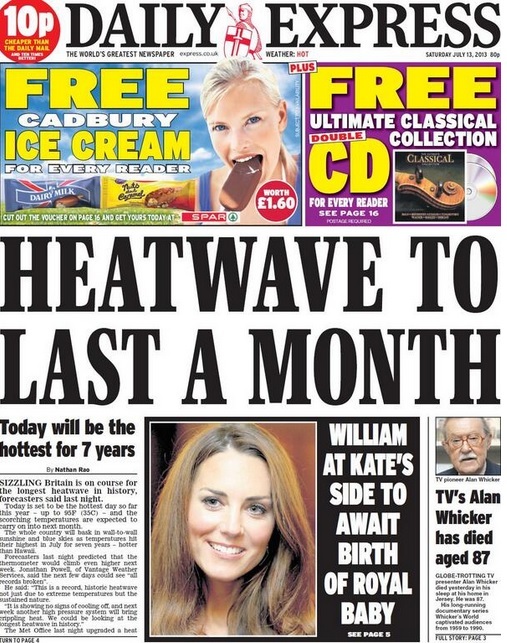 Two years later and newspapers were reporting the ‘hottest day for a generation’. The heatwave of August 18th – 20th August 1932 saw the temperature reach 99°F (37.2°C). This heatwave ranks 9th. The Leicester Chronicle reported cases of heat exhaustion and the curious sight of people carrying home butter in jugs while the 7.25pm and 7.30pm express trains from King’s Cross to the Western Highlands had shower baths installed in sleeping cars to help passengers cope with the heat. 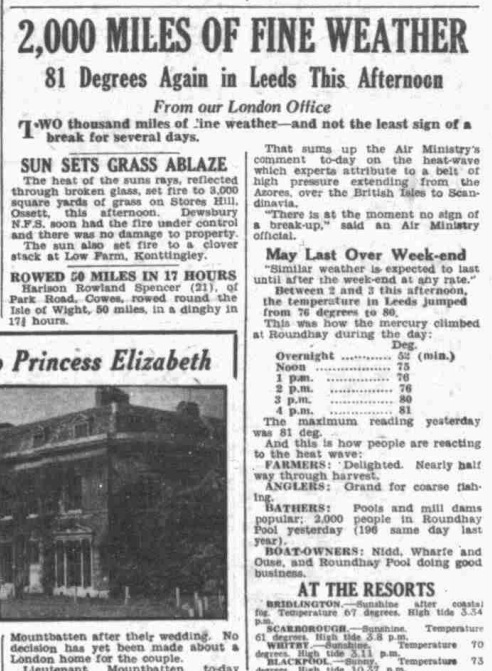 The heatwave of August 6th – August 8th 1947, which ranks 18th, was sparsely reported save for the usual heat stroke casualty stories and the fact that Cheltenham recorded 11 hours of sunshine on one sweltering day. By 1948 signs of a move away from straight reporting of heatwaves were beginning to appear. 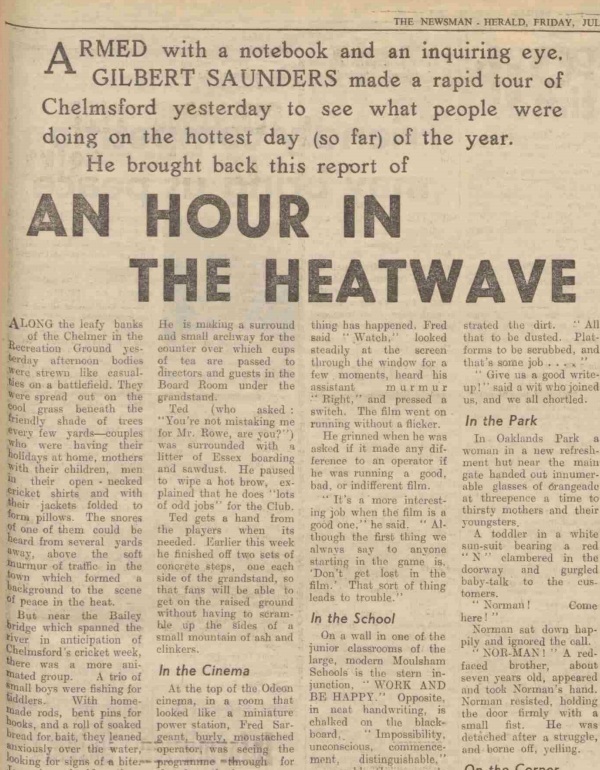 An Hour in the Heatwave, a report taken during the hot spell of July 28th – 30th, ranked 12th, was published in the Essex Newsman. The reporter, Gilbert Saunders, gave a simple but highly readable account of people going about their daily life in the heat. “The metropolis last night was like a large restless household—with all the lights ablaze, doors and windows thrown open, the family fretful, and endless pots of tea brewing far into this morning. “Perhaps one in ten among the 8,000,000 of us slept after midnight. For the rest, we tossed and turned and saw out this heatwave night, when temperatures were never below 71 degrees, a variety of ways. About midnight I walked past the gaunt old Edwardian mansions in Kensington. With the exception the lights that burned from every window, the scene was reminiscent of the early days of the Blitz. “At regular intervals the adolescent members of the squatting colonies were dispatched to the tea and coffee stalls on the corner, and perhaps for the first time in years these traders ran out of stocks. On the Kensington-Chelsea boundary, where life becomes noticeably less inhibited and on occasions less swish, a mixed group of young artists was sleeping on the pavement off Fulham Road. The column goes on to describe the situation in the House of Commons where the heat had reached “almost Turkish bath intensity”. 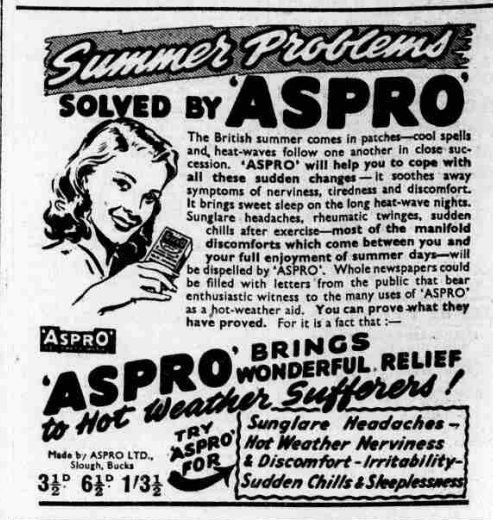 More evidence of reportage became evident during the June 1952 heatwave which ranks 8th. “London is hot. It is going to get hotter. That merry mercury column is poking up into the eighties already. That’s what faces us at the height of a heatwave. “Bus tyres sizzle on the melted tarmac in the streets. At office windows, the girls are pattering away at their typrewriters with damp, discouraged fingers. The reporter describes the scene at London Bridge at 9.30am: “Well, as I came over London Bridge with the 9.30 surge of sweltering suburbia, a bus conductor hopped off his traffic-jammed vehicle and grabbed a couple of ice chips off a Billingsgate lorry. One for him, one for the driver. “What I want, mate,” said the driver ungratefully, “is a ‘ole block of the freezin’ stuff – to sit on.” That is the male reaction to the heatwave. At 1pm he finds foreigners feeding the pigeons by Nelson’s Columns and Londoners feeding themselves on bags of strawberries priced at 1/9. By 3pm he’d made it to the Serpentine Lido along with 3,000 other people. He describes at like “Margate on a Bank Holiday”. The summer of 1959 was glorious but many cool nights saw the season fall short of my 23.5C threshold. It would be a long time before summers were nice again. The top 6 of my league of heatwaves are all occupied by much more recent events, including 1976 and 1990, both of which are dealt with in the blog I wrote last year – 50 years of London heatwaves. The heatwave that topped them all, in terms of sheer intensity and produced the UK’s hottest day ever, happened in 2003. I have vague memories of the weeks of sunshine in 1976 but the hot spells that stick in my mind the most are August 1990, when the UK temperature record was set in Cheltenham, Gloucestershire, and August 2003 when an 8-day hot spell saw the all-time UK temperature record broken when 38.5C was reached at Brogdale, near Faversham, Kent. In terms of length, heat and sunshine, therefore, 2003 comes out on top. Though many people will argue that 1976 is the more impressive summer that year produced two spells that satisfy my criteria, coming in second and fifth. The first heatwave saw temperatures soar above 31° C for six consecutive days from June 23. The start of the second, on July 3, saw Bjorn Borg win the first of five Wimbledon mens’ titles as he prevailed over Ilie Nastase in 35°C heat. The summer of 1995, which saw my driest-ever August with just 0.7mm of rainfall all month, comes in 3rd, with six days of mean temperatures of 23.5°C or higher. Looking back through history it is not really surprising that 2003 comes out on top. While it was hot in London the heatwave across the Channel contributed to the death of over 70,000 people throughout Europe, France being the most affected. Any football followers reading this will notice that my ‘premier league’ is two positions short. But with the gradual increase in temperature, particularly at night-time during heatwaves, I don’t think it will be long before these positions are filled. * There were hot spells before 1852 but I have excluded these: Luke Howard’s maxima observations from Plaistow, Stratford and Tottenham were taken under non-standard conditions and may be on the high side. I have instead focused my investigation on data recorded at the Royal Observatory, Greenwich. ** For some reason the data during a couple of years in the 1950s was incomplete – to fill in these gaps I used official data gathered at Kew. The data is completed up to the present day using my own observations taken since 1988. 1806: Very hot in parts of June and July. At Plaistow the temperature was 95 degrees on June 10th, and 90 degrees or upwards on three days. 1808: Very hot from July 12th to 19th. On the 12th a thermometer in perfect shade in a window in St James’s Park was 81.5 degrees at 3pm, and on the 13th at the same hour, 94 degrees. On the same day four men and seven women were killed by sunstroke in various parts of the Midland counties, and numerous coach and other horses were also killed. On the 15th a very violent and destructive thunderstorm in Gloucestershire, Monmouthshire, and surrounding counties. 1818:July a very hot month. At Tottenham on the 24th Luke Howard registered 93 degrees at Somerset House on the same day it was 89 degrees, and in the Strand 87 degrees at noon. The mean temperature of that day at Greenwich was 79.2 degrees, which was higher than any other day between 1814 and 1863. The following paragraph appeared in the Gentleman’s Magazine for September, 1818: “It is worthy of remark that the heat of the present summer has been universal. From the north to the south of Europe the heat has been greater and more lasting than for 40 years On July 24th the thermometer here (where!) was 98 degrees, which had never been reached except on July 16th, 1793. At Paris July 31st it was 93 degrees and at Philadelphia 100 degrees.” From 19th to 21st violent thunderstorms in the west of England. 1825: July remarkable, if not unique, in its constant and excessive temperature. At Stratford Luke Howard registered 90 degrees or upwards on seven days, the highest being 97 degrees on the 18th. 1826: The heat was very great. In May the thermometer reached 76 degrees, June 92, July 89, August 85. Two men were killed by sunstroke near London. The fields were as brown as the roads. After two months’ drought the rivulets were gone, and many of the wells dry. The hay crop was deficient from long drought. Country is parched, and corn in some places, though only a few inches above ground, was shooting into ear. Several hills and moors caught fire. In Worcestershire the excessive heat and drought almost wholly destroyed the pasturage, and trees were lopped to feed the cattle. 1846: July 5 was very hot, 93.3 degrees being registered at Greenwich, and 94 degrees at Clapham (94 degrees has been recorded there again in the only other instance at that station. 1852: July of this wet year was remarkably hot, the mean monthly temperature (66.6 degrees) having only been exceeded by July 1778 when it was 67 degrees; and July 1859 when it was 68.1 degrees. Tho extreme heat, however, was only 90.3 degrees at Greenwich. 1857: On June 28, 92.7 deg. was recorded at Greenwich. 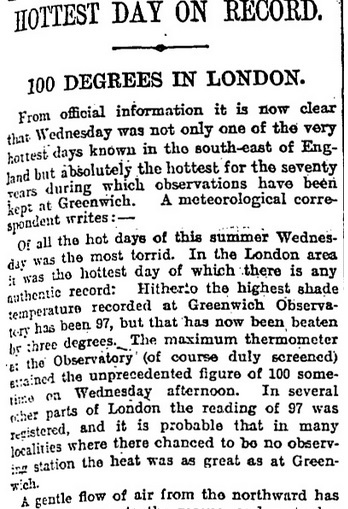 1858: June was a very hot day, 94.5 degrees being reached at Greenwich. A really nice look back at some historical heatwaves. Having lived in London and now on the edge of countryside I can say I’m glad I’m not living in a concrete jungle in these conditions. The night minimums a few weeks back were in the region of 10 degrees warmer there.